The world's weather keeps getting hotter, and more chaotic. 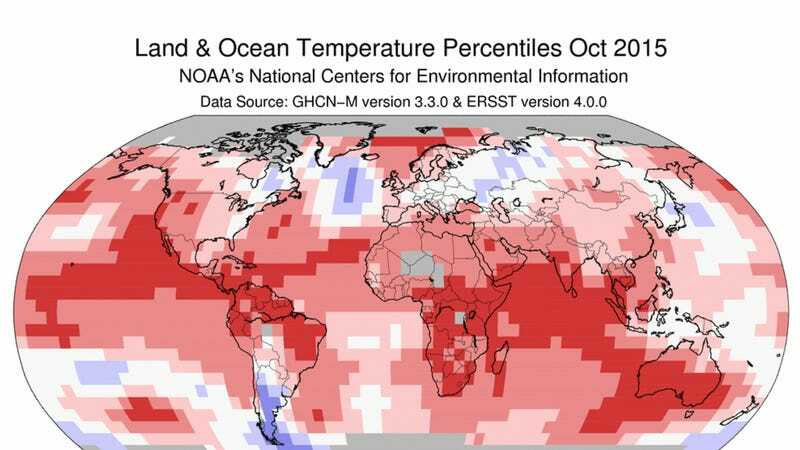 According to the U.S. National Oceanic and Atmospheric Administration (NOAA), this October was the hottest on record, with the global average temperature measured at 58.86 degrees Fahrenheit. That bested the previous record, set in 2011, by a third of a degree. Measurements at NASA, the Japanese Meteorological Agency, the University of California at Berkeley and University of Alabama at Huntsville also clocked October at all-time highs. It was also the eighth of 11 months so far in 2015 in which global heat records were sent—only January and April failed to hit new records; and it was also the hottest January through October for Earth on record, along with the hottest consecutive 12 months on record. "A complete blowout," said Jeffrey Sachs, director of Columbia University's Earth Institute, told The Associated Press' Seth Borenstein. "This year is going to be an all-time record-breaker." Compounding things is what Slate meteorologist Eric Holthaus is calling "the most intense El Niño ever observed." A reminder: An El Niño is the phenomenon of eastern Pacific Ocean warming caused by the flattening out of normal trade winds in the Western Pacific that usually corral this heat. Flooding rains and warm weather in Peru. Drought in Indonesia, Africa, and Australia. Torrential downpours and mudslides in southern California. Mild winters in the northeast. The checklist has already been met this year: In Indonesia, massive forest fires have made half a million people sick, and drought-induced food shortages are expected across the southern hemisphere. The northeast is also having an extremely mild winter season so far. Meanwhile, even though they are still technically in the calendar year of their drought, California has already begun to experience floods and mudslides, forcing dozens from their homes. "If there was ever a time to buy flood insurance, this is the time, Roy Wright, FEMA's deputy associate administrator for insurance and mitigation, told the L.A. Times. There may yet be more unforeseen consequences from all these events — ones that make Bernie Sanders' statement that climate change may be inducing terrorism seem not far off.